About this photo: Thematic. Silhouette. Here. Shooting the sun is a tough one, as the big ball of gas can play all sorts of tricks on my poor, astronomy-deprived camera. There are many scenarios where the green-hued auto-everything setting just won't do, and this is one of them. I was sitting by the side of the field watching our little man play soccer. It was early in the season, and he was getting used to the challenge of running back and forth across a gigantic field, trying to stay ahead of the play. I tried to capture as many pictures as possible because this seemed to be one of those experiences of childhood he'd want to remember later on. But there are only so many soccer-themed pictures that anyone can take, even if storage and battery capacity are virtually unlimited. Before long, they all kinda start to look the same. So I pointed at the sky and realized the setting sun was putting on a little show of its own. With Earth Day dawning tomorrow, I thought I'd nod toward the thing that makes the planet - and all of us on it - possible. Thanks, Old Sol. 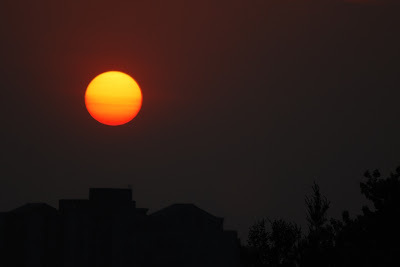 Your turn: What does the sun mean to you? The sun can be tricky. I was just reading about it, (I wanted to see if shooting it can damage your camera). This seems to be a good link. It's never a good idea to point a digital camera directly at any intensely bright light-source. Direct exposure to the sun while it is high in the sky can damage the delicate image sensor found in most digital cameras, the CCD. Fortunately as the sun approaches the sunset its intensity will diminish greatly. That's primarily because the light rays become scattered as they pass through atmospheric haze and pollutants that surrounds the earth. The closer the sun gets to the horizon, the safer it will be to point a digital camera at it. Never stare at the sun. You will cause damage to your eyes. Beautiful sunset. I'm a big fan of sunset pictures, and they are tricky to capture correctly. The sun means many things to me, depending on the context I choose to use it in. My Cree name is Sun Woman, this is a very powerful name... why I got this title I have no idea but it all happens for a reason! Now the sunset, I LOVE sunsets and I love your photo of the setting sun. The sunset gives me time to reflect on my day and for some reason the song "How Great Thou Art" seems to come to mind when I watch the sun setting. The sunrise, I love waking to the sunrise... that means it's going to be a fantastic day, especially if the birds are chirping and I can hear them. Cheers. Have a wonderful week! as my time keeper it is the way I mark not only days but also seasons. as my energy source, it feeds me in a way similar to the plants that I love to grow! As a literary tool, there is hardly anything that is as useful as thoughts of the sun, its solar system and the seasons. G-d has given us a great gift and it just KEEPS ON GIVING! good pic, as usual! You can stare at the sun, as it rises, without damage to your eyes. see SUNGAZING or the amazing documentary, Sun Eaters, on how some are gaining energy directly from the rising ( or setting) sun, through the portal of their eyes. On leaving our own trail. And Mondays. Kids who defy gravity. Next Oprah. Facebook buys Instagram. My $0.02. Mike Wallace dies. Another Mike comes to mind.